In order to respect martyrs and cite the brave spirit of revolution, the former president, Chiang Kai–Shek, approved of the organization regulations of committee of Martyr Shrine reconstruction. The reconstruction started in December, 1967 and was completed on March 25, 1969. It was reserved as the use of central government. On March 29 (Youth Day, commemorating the Huanghuagang Uprising) and September 3 (Armed Forces Day) of every year, the president of R.O.C leads the heads of the five Yuans(branches of the government) to pay their respects to the martyrs by bowing and offering incense. 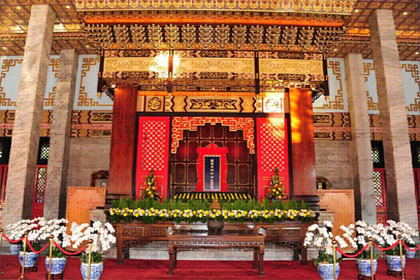 Furthermore, The President comes to worship the far ancestor of Chinese, Huang Di, on April. 5 every year and worship the founder of R.O.C, Dr. Sun Yat-sen, every four years after the president inauguration. The Martyrs Shrine was subordinate to military and history translation office, and then was transferred to the subordination of Combined Logistics Command on July 1, 1998. On January 1, 2006, it was transferred to the subordination of Reserved Command. The Martyr Complex covers an area of some 52,000 square meters, of which the buildings occupy more than 5,300 square meters. The buildings of the shrine complex can be categorized as gateway, wing-rooms, bell tower, drum tower, shrine portal, civilian-martyrs shrine, military martyr shrine, and sanctuary. Martyr shrine, which is located in the north and faces the south, is surrounded with three red enclosures. The only side without enclosure leans on the hill, Yuen Shan. All the constructions were built in Chinese traditional architectural style. The golden roofs, red pillars, dramatic beams, and the marble floor make martyrs shrine magnificent, splendid, and solemn.